To cry in the first half hour of a film means you are looking ahead to a picture filled with emotion. “Black or White” starts with scene in the hospital where Eliot (Kevin Costner) just lost his wife Carole (Jennifer Ehle) in a car accident. They had been raising their biracial granddaughter Eloise (Jillian Estell) after the death of their daughter during childbirth and the father Regie (Andre Holland), a drug addict, had taken off. Her paternal grandmother, Rowena, (Octavia Spencer) who had been okay with the arrangement now decided, with the help of her lawyer brother, Jeremiah, (Anthony Mackie) to fight for custody of Eloise. There is a little heavy handed melodrama here and there but none, pardon the pun, of the characters are black or white. We see the difference between living in Santa Monica’s white enclave and South Central’s Black area in Los Angeles along with the Mexican housekeeper for the lawyer Eliot and the very much extended family of daughters, sons, sisters, brothers, nephews, nieces living under the same roof and sustained by Rowena, also known as Grandmother Wee Wee. The director, who also wrote the screenplay, Mike Binder, based the story on his own family involving a biracial nephew. Though he faces some of the Black versus White problems, including the use of the N word, he skirts around some of the major issues and a blow up near the end seems completely contrived to get to a Hollywood ending. He also errs in writing the character Fay (Gillian Jacobs) completely unnecessary to the film and making Eloise’s math tutor and piano teacher, Duvan (Mpho Koaho) multilingual, speaks only 8 languages, seems to have written published papers on almost all subjects talked about, just a little bit too much though he does supply some humor. 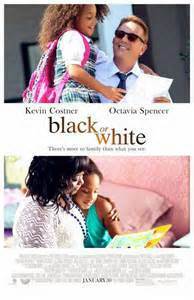 Though there is nothing special regarding his direction of the movie the acting is strong all around with star turns by both Octavia Spencer and Kevin Costner while Jillian Estell, as the 7 year old, is cute at the right times, playful at others and serious enough when she is required to be. The differences between Holland and Mackie as brothers are a little hard to take to accept them as such but individually they are their characters. An aside regarding critics: I wanted to see this film based strictly on previews but if I had read reviews before I went I would never have gone. Reading the reviews I just shook my head at how many people will miss seeing a good film.